We've got the details from Alton Towers exhibition which started this afternoon. The Alton Towers Hotel is currently hosting an exhibition of the Resort's Long Term Plan, and we've been on park this afternoon to check out the details. The exhibition wasn't intended to be a comprehensive detailed look at everything planned over the coming years - it would be impossible to do so - but rather it represents the vision and general direction in which Alton Towers plans to head between now and 2019. Many of our predictions were broadly correct, with provision for 10 large to medium sized rides to be added during the term of the plan and three potential coaster sites highlighted on the map. New hotels and entertainment facilities are planned and the possibility of a new park entrance near Forbidden Valley. 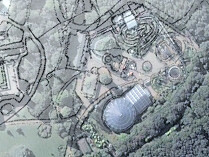 The plan also includes details of how Alton Towers is looking after the heritage of the site and their aims for sustainability and ecological benefits. The traffic strategy is another element detailed in the exhibition. You can find a full write up in our featured article Alton Towers Long Term Plan Exhibition, and we'll be adding to this over the coming days. If you want to check out the exhibition for yourself it is open until 9pm today in the Emperor's Suite of the Alton Towers Hotel and from 10am to 4pm tomorrow (Saturday 27th July) when it will have moved to Sir Algenon's Lounge in the Alton Towers Conference Centre. Try and wear 'light' clothes - they'll dry off quicker.